Nissan has announced a number of new features and design upgrades to its popular Juke compact crossover. They enhance both the exterior and interior of the car, which made its public debut on the Nissan stand at the Geneva Motor Show. Coloured body parts, including front and rear bumper finishers, doors side sills and mirror caps, are also available through the personalisation program. These are standard on BOSE Personal Edition and optional on Tekna models. 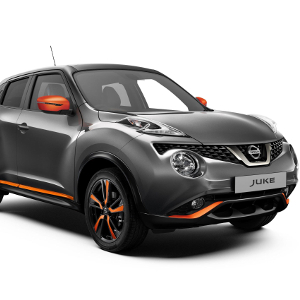 Two vibrant new body colours – Vivid Blue and Chestnut Bronze – further extend customer choice on Juke. Improvements to the interior include the choice of two new personalisation colours – Energy Orange and Power Blue. These further enhance the design of the central console, air vents, door inserts and seat upholstery. Gloss black interior personalisation remains available. Interior personalisation is standard on BOSE Personal Edition and Tekna grades. There is also a higher grade of leather on the steering wheel, plus improved visual clarity on the combimeter thanks to a new white-on-black information display.